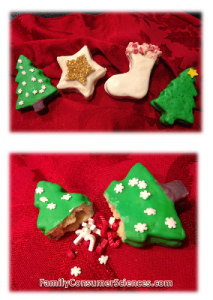 Making Christmas cookies is fun but always challenging to find new, fresh ideas from the traditional basics. Pinata cookies are cookies that have candies in the center (like a pinata) that are not baked with the candy in the center but rather are assembled after baking. These are completely iced cookies and sound neat when you shake them. 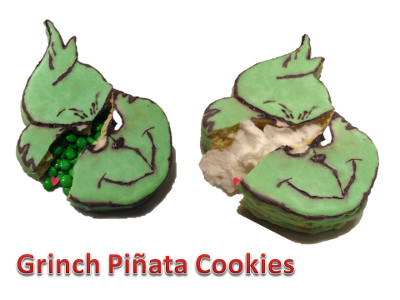 Each pinata cookie will need contains three cookies, a top, a bottom and a middle that has the center cut out. Be sure that the middle is a thick cookie, 1/2 thick to hold the most filling! Bake the cookies, I suggest baking all the middles together since they are thicker. 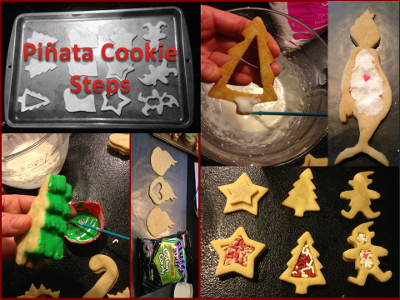 Be sure that the shape of each cookie is the same (not altered when you transfer it to the cookie sheet) so they line up to glue them together after baking. One of tip in doing this is to cut out the center after the cookie is on the cool cookie sheet. Make the icing. It must be royal icing so it hardens completely. Use the icing to “glue” the middle to the bottom piece. Fill the centers with candy. Carefully paint icing on the middle piece and “glue” the top cookie to the middle. 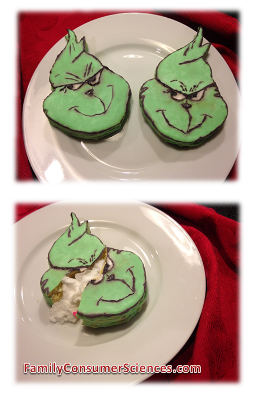 Dip or paint the cookies with icing. Be sure to completely cover the sides. Decorate as usual. Be sure to choose a large enough cookie cutter that there is a good amount of candy in the cookie. Don’t cut too close to the edges of the middle cookie when taking out the center or else they may break when assembling. Make the top and bottom cookies thin so the whole cookie isn’t too thick. If using cotton candy you must take care not to get any icing or anything wet next to the cotton candy or else it will melt. This means the icing must be completely dry when assembling. What a great idea! And they look delicious as well.